This end table's contemporary design has global appeal that is sure to complement your living room's own personal style. 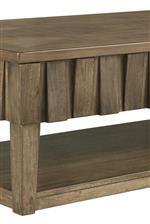 The table top features a hinged top, providing you with concealed storage. Alternating wedge blocks along the sides help to create this cocktail table's welcoming aesthetic. The Rowenbeck Contemporary Rectangular End Table with Hidden Storage by Signature Design by Ashley at Conlin's Furniture in the Montana, North Dakota, South Dakota, Minnesota, and Wyoming area. Product availability may vary. Contact us for the most current availability on this product. This collection brings contemporary style with a modern global edge to your home. Complete with features such as parquetry inlays and accenting wedge blocks, these pieces are a welcome addition to any space. The Rowenbeck collection is a great option if you are looking for Contemporary Casual furniture in the Montana, North Dakota, South Dakota, Minnesota, and Wyoming area. Browse other items in the Rowenbeck collection from Conlin's Furniture in the Montana, North Dakota, South Dakota, Minnesota, and Wyoming area.